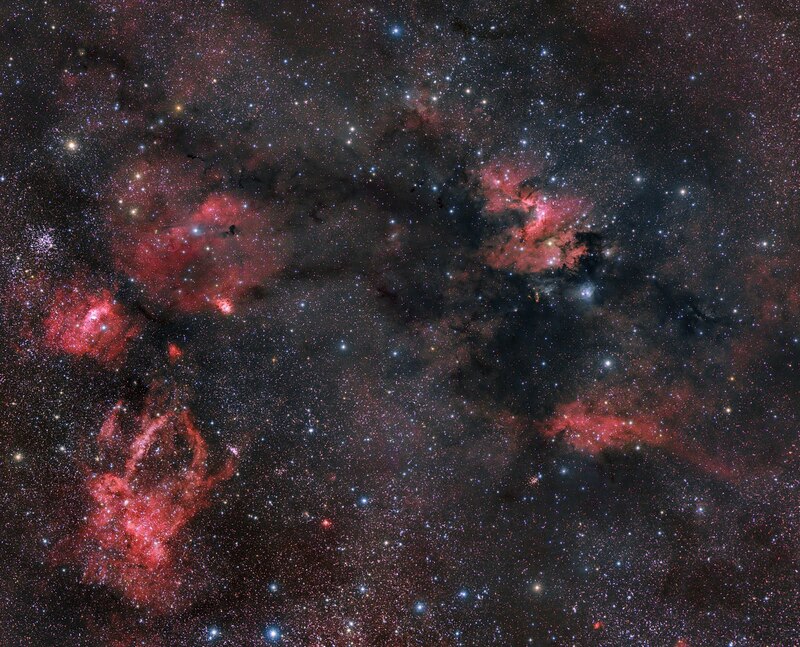 Here is a 2 panel mosaic from the constellation Cepheus. I wanted to frame both the Bubble Nebula (far left) and the Cave Nebula (far right) into one composition, so this forced me to shoot two different fields and blend them together into this mosaic. It was a lot of work, since I shot separate passes for L, Ha, R, G, B, and then not only did these pieces need to be registered, but also matched in terms of exposure (which can vary because of angle in sky and high clouds, etc.). But I am very happy with the end result. 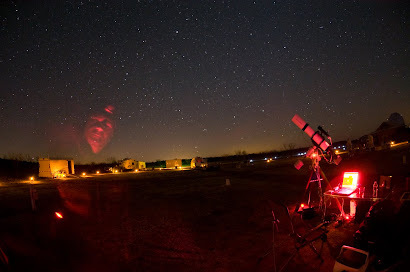 There is so much to see in this field -- red emission nebulae, dark nebulae, reflection nebulae, dust, etc. Sometimes these images remind me of abstract surreal art by artists such as Tonguy, Matta, or Richard Powers (I am a huge fan of these artists). This image represents about 9 hours of exposure last week at the 3RF astronomy campus. 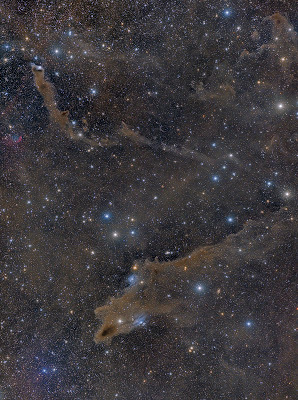 This huge dust field resides in the constellation Cepheus. It stretches from reflection nebulae VDB 150 to VDB 152. This represents one of my favorite types of objects -- dusty reflection nebulosity. Reflection nebula reflect light from nearby stars (duh) as opposed to emission type nebulae that glow like a neon sign. 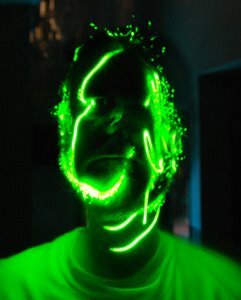 As such, reflection nebulae have a naturally cool 3D appearance. 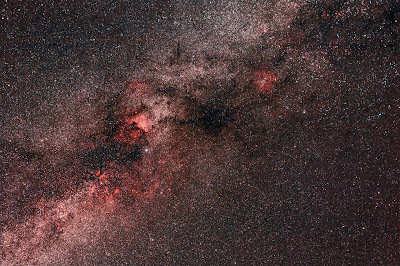 I imaged this last week at the 3RF astronomy campus and had 3 excellent nights of clear dark skies! Not only that, but the Perseid meteors put on quite a show. It was a fantastic trip. Here is a shot of the Cygnus & Cepheus region of the Milky Way I took last fall at the Okie-Tex Star Party. I never processed it because I never thought the data was very good. But a week ago I started testing a new (to me) piece of software called PixInsight designed specifically for processing astro images. I decided to go back to old data to see if I could resurrect anything. I'm pretty happy with this test run! Not only is this data a "blast from the past", but you can see the remnants of a literal blast from the past -- the Veil Nebula (a supernova remnant). Look closely and you can see some tiny semi-circular "arc" type structures at the far left.